While scientists struggle to objectively test and quantify animal intelligence, thoughts and feelings, I think most people will agree that intuitively animals are capable of many of the attributes that previously were thought to separate us from the rest of the animal world. A recent example for me was when I came across a hoary marmot that had been killed on a road. The adult female was still lying on the pavement, so to limit the potential of other animals meeting the same fate, I moved the body a short distance away. As I was about to leave I noticed a young marmot watching me from a nearby rock crevice. I moved back to not interfere and watched as the young pup approached its deceased mother. The pup tentatively approached the body and after an initial assessment it frantically tried to pull its mother into the burrow. With the body weighing several times more than the pup, it wasn’t strong enough to get it completely inside the burrow and after several minutes of trying, it gave up. However, instead of leaving, it started licking its mother’s face and intently staring at her. This was repeated a few more times before the pup stopped and came out of the burrow to sit next to the body. Over the next several minutes it rested on the mother while glancing down at her. It sniffed her paws and laid on her chest. About an hour after the pup had found its mother it turned away from the body and slowly moved off to another burrow. As I left the area I starting thinking more about what I had just witnessed. I realize that my observations are subjective and I can’t say with any scientific certainty that the marmot was grieving the loss of its mother. However, what is scientifically known is that the portion of the brain responsible for intense emotions and grief is present in all mammals, not just in humans. Scientists have reported mourning in other social animals including elephants, great apes, dolphins and domestic dogs to name a few. Furthermore, recent research involving the prairie vole, a small rodent that forms strong, monogamous bonding with a mate demonstrates that they enter a grief like state at the loss of their partner and can even succumb to depression during this period of loss. Hoary marmots are also highly social rodents. Pups spend the first two years with their parents and siblings before they go off and form their own families. They are known to recognize individuals, greet and groom each other, engage in play behaviour and spend the winter hibernating as a family. Therefore, intuitively it just makes sense that they would experience some level of mourning at the loss of a close family member. Proving it scientifically will be difficult, but I’m willing to give them the benefit of the doubt. 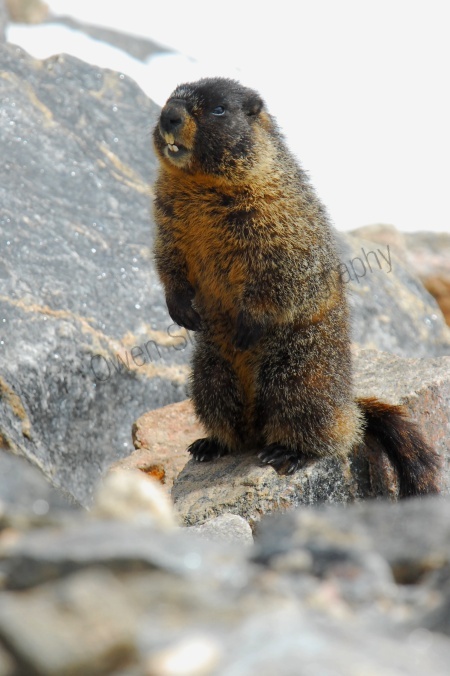 These marmots are found only in western Canada and the United States and are typically found at higher elevations. This one was hiding in the rocks surrounded by tundra at about 12000 feet. On a recent hike from Moraine lake in Banff National Park to Lake O’Hara in Yoho National Park myself and some friends descended into a valley where there was an usual rock called Eagles Eryie (photo to come later) jutting out of the ground. This and several other Hoary marmots were using the rock formation as their home.